not indicated in these memes, is the notion that, not every individual can dedicate the time or considerable resources needed to be able to achieve that level of fitness. CrossFit is both a cost–prohibitive endeavor with a strong corporate sponsorship structure ingrained into its operation and proliferation. Similarly the memes that use common pop culture icons to further the tough, hardworking beastly mentality serve to normalize these notions. If Ryan Gosling loves CrossFit, we all should. This is an image of a CrossFit champion though he goes unnamed in the image, perhaps granting him the potential to be any man as CrossFit proclaims to be a sport for everyone. This is in spite of an affiliate structure that caters only to those who have upwards of $150 to spend on monthly membership, though hypothetically a CrossFit box is not a requirement for participation. By showing a capable and physically fit man in the process of motion, while asking the question about giving up, indicates that this man answered that question and chose to continue forward with his exercise regimen past the point of exhaustion. Regardless of his prominence in the CrossFit community, the man in the image is presented as powerful, referential and strong. His fitness is one that, as perpetuated through the tropes of the meme, ought to be imitated. 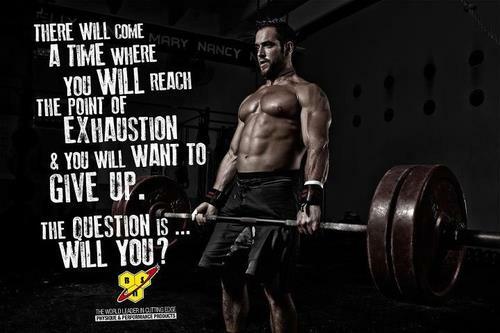 If we want to reach his status, his level of fitness, exhaustion cannot enter into our imaginary. The limits placed on the imaginary of what is and is not acceptable in the universe of CrossFit serves to establish a sort of ritual, in which hard work is valued above all other values, perhaps even that of physical and emotional exhaustion. If we are to see images as David Morgan does as appealing to and relying on the body, “provoking fear, envy, pride, desire, obsession, rage” then we can recognize their power (Morgan, 2008, p. 96). This image evokes that power quite effectively, using these visceral reactions to it to motivate practitioners to meet and surpass the level of this elite athletic figure. Here we see multiple things happening. First, the woman again has her face turned away from the viewer, this allows a viewer to see themselves in her image. Through this the image “indulge[s] passions,” (Morgan, 2008, p. 97) cementing an emotional and visceral connection to this image and an identification with the subject. Perhaps even more specifically, an embodiment of the subject. As Roland Barthes indicates, “the photograph is the advent of myself as other: a cunning dissociation of consciousness from identity” (Barthes, 1982, p. 12). This image, more than any of those others, but operating as one of many CrossFit images, cements this notion of embodying one’s own success through the physical success and power of others. We see the woman’s physical prowess, dominance and superiority in her muscles and in the way she is lighted on a dark background. She is the beacon of light, using her ability to overcome her own challenges to embody greatness in the most physical sense but also as a point through which others can find motivation. Her image moves others to action through its exemplary strength. CrossFit exists without and outside of its existence online, but what we see here is quite interesting. The space fostered by social media allows for a degree of expression and commitment that surpasses the hours spent in the gym. 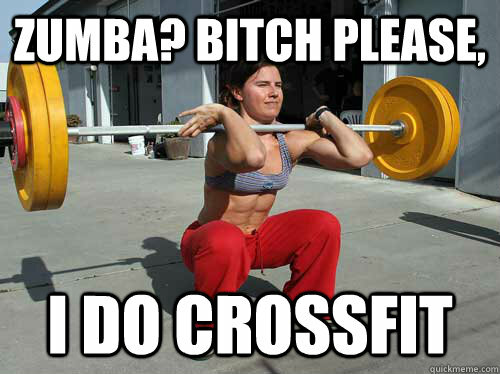 These memes become a forum through which to express devotion to the ideals that make CrossFit what it is. There is a certain faith in CrossFit to take us lowly amateur athletes and make us into the people whose images we worship through the memes we create. We appropriate their images, re-mediate them and create meaning with and through them. We find something akin to religion in the devotion to the unyielding desire to harness the power of our minds to overcome the obstacles of our bodies. This religiosity, this devotion proves very powerful and it would not, could not exist without a forum through which to share it and allow it to permeate our everyday understandings of who we are and who we want to be. So my motivational sayings, those trite, tired things we shout at each other at the zenith of physical exhaustion, they acquire a power of their own afforded to them by technology and cultural form.